Three Indians, who won the inaugural NYC BigApps competition hosted by mayor Michael Bloomberg earlier this year, rang the ceremonial closing bell at the Nasdaq on Monday. 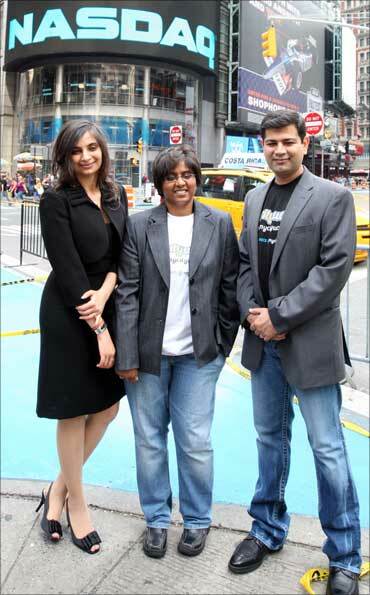 Archana Patchirajan, Puneet Mehta and Sonpreet Bhatia won the NYC BigApps Competition award, for inventing most useful, inventive, appealing, effective, and commercially viable application for delivering information from the City of New York. They created MyCityWay apps on the mobile device that provides information for over 50 resource categories in the city - including restaurants, nightlife, hotels, traffic, public transport, safety and green efforts. 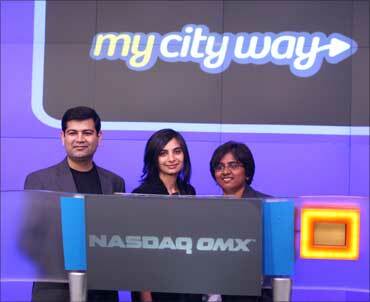 Image: (From L- R) Puneet Mehta, Sonpreet Bhatia and Archana Patchirajan - the co founders of MyCityWay. The application was a big hit in the city-wide competition, following which the trio have now founded their own company, MyCityWay. "As a startup company, we are delighted to be building a product that will enable the creation of smarter cities - cities that allow active interaction with residents and visitors through our apps," said the company co-founder and partner, Patchirajan. 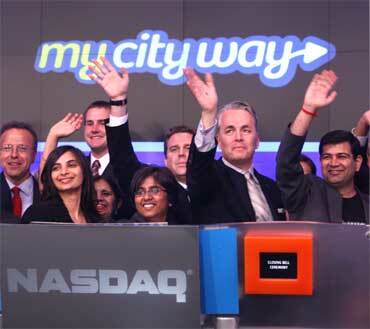 MyCityWay has gained presence in 10 cities, including Boston, Chicago, Los Angeles, San Francisco, Washington, DC and London, and plans to expand in over 40 cities in the next 4 months, according to the founder group. "We are being contacted by different cities to build similar one-stop apps to help locals and tourists alike," said Sonpreet Bhatia. "Police departments from a couple of cities are seeking our help to include relevant safety tips from them within our city based apps," she added. MyCityWay apps are currently made for Apple and Google mobile platforms and are currently available for downloads for iPhones, iPads and all Android-based phones. "You can easily plan your vacation in New York city using the application on a flight in offline mode," said Puneet Mehta. All the three co-founders, who have now quit their jobs to focus on their new venture, moved to the US about this decade. Patchirajan moved to the US in 2004, and has held senior technology roles with Wall Street firms before taking up this new venture. Similarly, Bhatia moved to the US in 1999 and has worked as a vice president with Merrill Lynch. Mehta migrated to the US in 2000 and worked in senior technology roles with Wall Street firms before his tenure as senior vice president with Citigroup. Image: The trio in front of the Nasdaq building in New York. What is card cloning? How can you be safe? College dropout makes low-cost flying car, more!